…I think… (see previous post about WIP existential crisis). I’m sure my plot will keep evolving as I undertake this re-write, but–fingers crossed–I BELIEVE I’ve at least got a solid idea for my inciting incident. Backstory: I always like to make things hard for myself by choosing to do things like write first person, dual POVs that involve a character from a different cultural background from my own. So this means lots of research (that’s a whole different topic of conversation) and also that each character needs an inciting incident. I also write contemporary YA without an obvious antagonist, like a dragon to slay or something. My MCs have to do battle against themselves and their parents and poverty and school, all in the context of legal proceedings they have no control over but threatens almost everything in their lives. So plotting this novel is no small task (for my brain, at least)…. I felt strongly that, in this WIP, the characters’ inciting incidents needed to be at least loosely connected without putting the characters and their families at odds. While majorly disrupting each characters’ lives and setting the mirroring plots in motion. The plot then should just follow: and then..and then…with each successive plot point making life harder than the last and the MCs making wrong choices in response to plot points that threaten to put their life dreams out of reach. All driven and fueled by each character’s fears, weaknesses, and core needs, while keeping in mind where I want my characters to end up as human beings. They are like real people in my brain. Yep, I also spent many hours brainstorming around my characters’ internal workings and character arcs, which helped substantially with plotting. I have an idea of who my characters are when I start writing, but they evolve and grow more complex as I go; I don’t truly know who they are until long after the first draft, but all this got me tons closer. I can just feel that we’re almost there. Our novel will be loads better because we took all this time to delve deep into our characters and their lives, and thought hard about what risks exist in their worlds and used all this to create an inciting incident that leads to the story problems that drive the plot. The feedback the incited our examination of the inciting incident, I can’t even…. 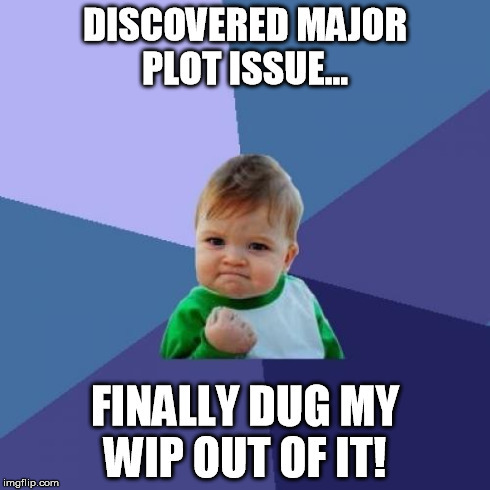 Hey writers, have you a time when someone saved the day for your WIP? Sounds a little like doing seating arrangements for a weddings as to who to seat where. Glad you’re making progress. When do you leave Singapore?